This morning, as I unloaded this quilt from the frame, I was glad to be reminded of times past. Some of my readers may not be familiar with the story of my daughter Eleni, who was born to us in 2015 and died the following year due to complications with her birth. Although our time with Eleni was a brief 10 months, it felt like a lifetime of fighting, loving, losing and learning. Many of my readers joined me in all of the above, and especially in the fight. Stephanie was one of those people. Do you remember? My mom and I would travel out of town for about a week each month to take Eleni to special therapies. One of the best therapists was in Chicago, along with a groundbreaking neuro-optometrist. It was an incredible blessing when Stephanie and her husband opened their Chicago home to us, allowing Eleni’s therapy funds to stretch so much farther. We stayed with them a total of three times, I believe. Those weeks were each precious. I know you’re not surprised, because quilters are some of the nicest people! But you’d also love to see her creations. Staying in her home meant I got to see things firsthand. Stephanie (@yespositivley) has an incredibly style. I love the way she mixes and matches fabrics! So imagine my delight when she placed an order for Stitched in Color quilting services! Here are Stephanie’s quilts, which I had the pleasure of quilting this week! This first quilt is actually a pattern from my Angled Class. In Angled I taught students how to sew equilateral triangles, diamonds, flying geese, half square triangles, multi-angled patchwork and liberated blocks. This quilt design, called Indian Blanket, worked out our equilateral triangle skills. The interplay of different-sized triangles is pretty fun. Although this one was a “skills builder” or so she said, Stephanie obviously already knew what she was doing in the color and fabric realm. It looks like she pulled her palette from a few multi-color prints. Such a happy, yet modern vibe! P.S. If you’re looking to develop your angled piecing skills, the Angled Coursebook is available as a PDF. For quilting, Stephanie suggested something angular. I selected this Summit design and like very much how it turned out. Hopefully she does too! Guess who got a new website? Stop by and save 20% off your order with code NEWSITE. Now there are multiple ways to search and explore, plus larger pictures to help you get a “feel” for the fabrics. Stephanie’s second quilt that came in for quilting services is that Chic Diamonds quilt I took off the frame this morning. This quilt is cut with a Quick Curves ruler. It’s a pattern I’ve been thinking about making myself..
Isn’t it stunning! Placing a few low volume squares for negative space was a brilliant idea. For quilting, I suggested Curls Allover, a unique edge to edge quilting design that doesn’t repeat, in order to mimic hand-guided quilting. I shot this photo in very high contrast to make the quilting texture jump out at you. Crossing fingers that Stephanie, who enjoys dense quilting, will be pleased! We agreed upon a mauve thread, which matches some fabric on the quilt top and contrasts nicely with the rich, black backing. Gah, I can’t get over those luscious curls. I’m considering putting this quilting design on my current work-in-progress! Like I said, I’ve been thinking about making a Chic Diamonds quilt. Last time I worked with the Quick Curves ruler, I enjoyed the process. But I think I’m going to have to wait a bit to let this gorgeous quilt fade from my mind. I love it so much and it feels so perfect, that I think I’d be disappointed by my own version. Haha. 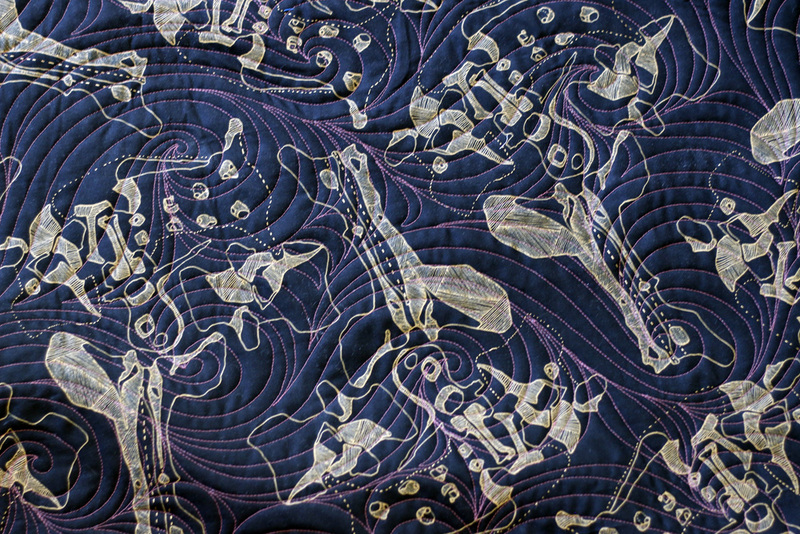 Thanks so much, Stephanie, for allowing me to be part of these quilts’ stories. And thank you, always, for your epic hospitality.